When Ferrari tried to homologate the 250 LM as a mid-engined 250 GT motorsport's governing body (FIA) finally had enough and refused. The interest in GT racing cars had skyrocketed in the early 1960s as they replaced the prototypes in the World Championship for Manufacturers. To have a car homologated as a GT at least 100 cars of that type had to be manufactured. In the first few years it was enough for a manufacturer to show the plans for the 100 car production run, but usually shortly after the homologation papers were signed, production was halted. Aston Martin fooled the authorities by numbering their DB4 GT chassis down from 200 and Shelby only produced a handful of coupe bodied Cobras. Ferrari's highly successful 250 GT SWB was in fact built in sufficient numbers and formed the basis for the 250 GTO. Throughout the 1961 season Ferrari had used the option of homologating small changes to introduce all kind of technical novelties to the SWB. At the end of the year all these small changes were combined in one car to create the 250 GTO and Ferrari was able to homologate this distinctly different car as a derivative of the SWB without having to build 100 examples. After two incredibly successful seasons the GTO was up for replacement and Ferrari felt a 'few minor' modifications were not going to be sufficient this time round. Cooper's huge success in Formula 1 in the late 1950s had shown the racing world that a mid mounted engine was superior over the traditional front engine layout. For the first few years of the 1960s Ferrari had reserved this layout for their single seater and prototype racers. In the 1963 24 Hours of Le Mans Ferrari scored the first major mid-engined sports car success with the 250 P.
In good Ferrari tradition, the 250 P still shared many components with its predecessors, despite the novel chassis design. The most familiar part was the well proven Colombo short-block V12 engine, which it shared with GT cars like the 250 GTO. For Enzo Ferrari the engine was the most important part of any car, and hoping he could convince the FIA of the same thing Ferrari set out to develop a civilised version of the 250 P for GT racing. Launched at the 1963 Paris Motor Show this '250 LM' looked strikingly similar to the 250 P, but still Ferrari insisted it was not very different from the front-engined 250 GT. As mentioned earlier the FIA refused to homologate the 250 LM as another variant of the 250 GT, which made perfect sense. It was now up to Ferrari to convince the FIA that there was a clear intention to produce 100 examples of the mid-engined 'GT'. Even today an Italian mid-engined V12 sportscar is considered highly exotic, so the FIA's skepticism was very understandable. 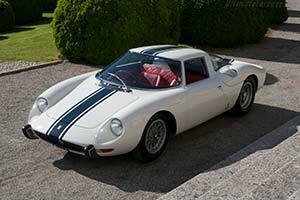 Regardless Ferrari continued the development of the 250 LM throughout the winter of 1963/1964. One of the biggest changes was the installation of a 3.3 litre version of the engine, but with homologation in mind the car was still referred to as '250 LM', where '275 LM' would be more appropriate.